Are you trying to win an argument, or earn forgiveness? Perhaps somebody in your life had a bad day? Do you ever just look at a situation and think, “I wish people would just smile.”? I have two suggestions for you. Make candied bacon. All sorrows will be forgotten. 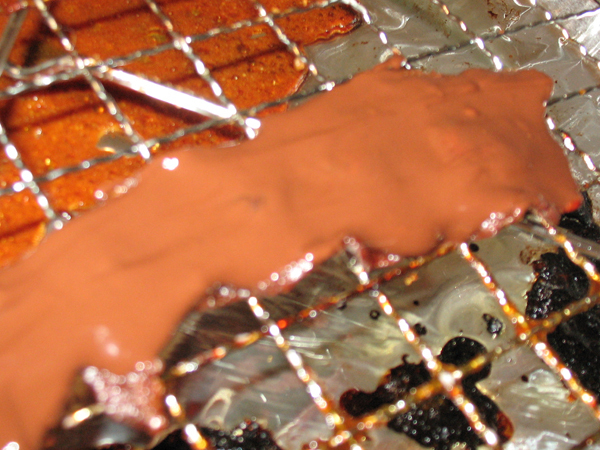 Make chocolate-covered bacon. You will be elevated from mere mortal to goddess. 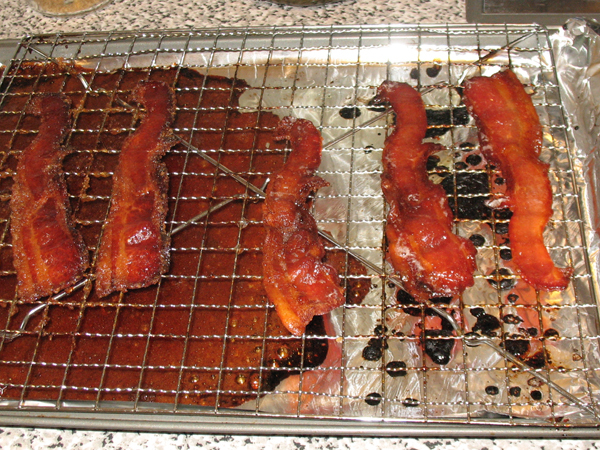 Tonight I made brown sugar candied bacon, maple syrup candied bacon, and chocolate-covered bacon. I did this heinous thing because Boyfriend had a bad morning, and I wanted to put a smile on his face. Oh, did I ever! Before I got to work on this, I consulted my bacon guru M, who introduced me to Epic Meal Time, and loves all thing bacon. (Actually M coached me through cooking my first tray of bacon.) After listening to his sage advice on the questionable art of candying bacon, I got started. 1. Pre-heat oven to 177°C / 350°F. Line the baking sheet with tin foil, and place the cooling rack on top of the sheet. 2. 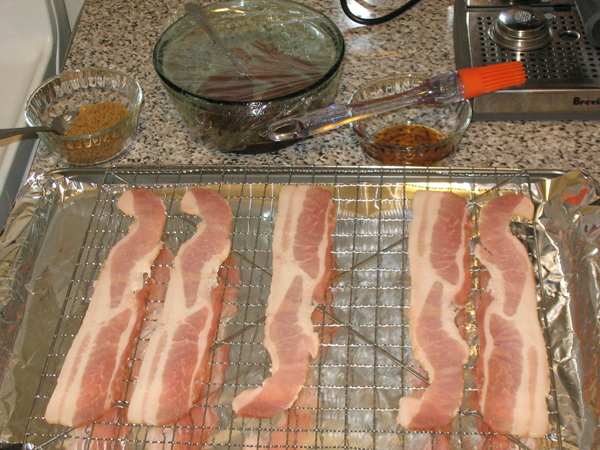 Place the bacon onto the rack and don’t let the pieces touch. 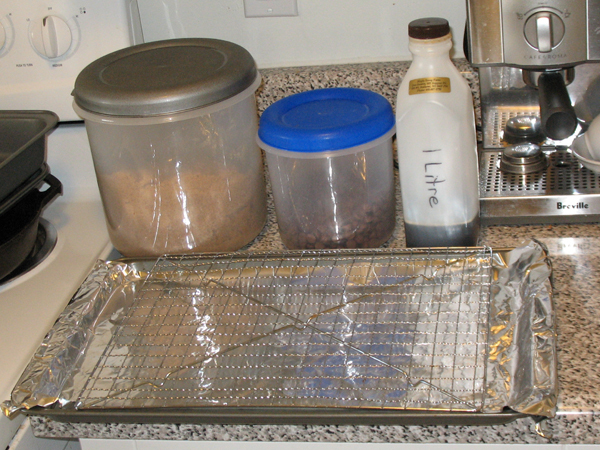 Pictured above the tray are dishes of brown sugar, chocolate, and pure Nova Scotia maple syrup. 3. I used a large spoon to sprinkle sugar onto the first two strips, and pressed down with the spoon to get it flat. The middle strip is plain, because it’s getting coated in chocolate later. The two strips on the right have been basted on both sides with maple syrup, although you can’t tell. If you were thinking of skipping using tinfoil, don’t. By this point the caramelized sugar started smoking. I wasn’t positive that it had cooked long enough but after letting it sit for a few minutes it felt very crisp. 5. 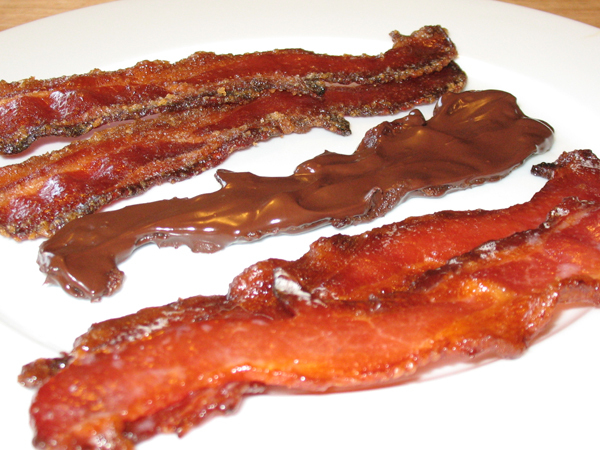 Once the bacon has cooled, melt the chocolate and use a spoon to coat one side of the plain strip. Let it sit for awhile before picking it up by the edges to flip, and coat the other side. I re-heated the chocolate so it would be easy to work with. My plan was to use milk chocolate, but it seized. Boyfriend requested bittersweet chocolate but we are out, so he got semi-sweet instead. 6. After coating the second side, let it firm up. Once it’s as hardened it’s ready. I let it sit around 30 minutes so it was still a bit soft. If you want more of a candy bar feeling I imagine you’ll need to let it sit a lot longer. Verdict: I made this for Boyfriend because his morning got off to a bad start and he was in a foul mood for most of the day – until he walked in the door. Once he saw what I was making, I had to beat him off with a spoon. Next we tried the maple syrup pieces, which tasted just like regular bacon, albeit more maple flavoured. I thought the chocolate-covered bacon had a strange texture, and a smokey after taste, which was not present in the other pieces. 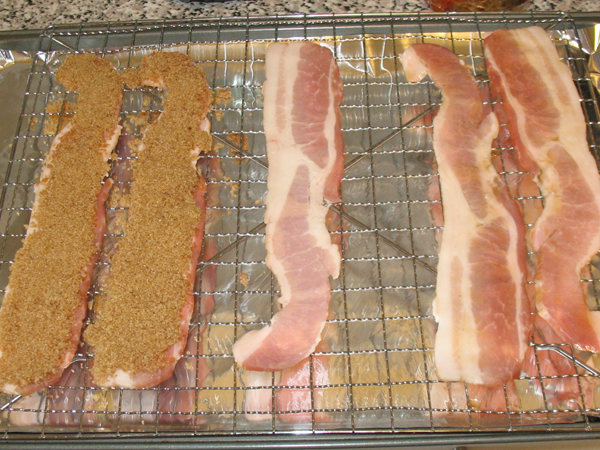 Not being a bacon fan, I did find the brown sugar pieces tolerable, and kind of interesting to eat. 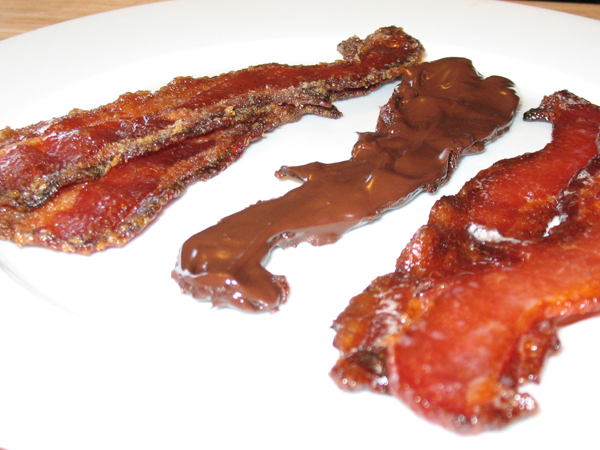 This entry was posted in candy and tagged bacon, boyfriend, food, Love, recipes. Oh my god! I need to try this! !